This is an exciting time for us at Timeless because we finally get to review a watch from one of our favorite brands, Omega. We could, of course, review virtually any model Omega makes, but we decided to launch our new partnership with something particularly timely, the new James Bond edition of the Aqua Terra. I think it's a serendipitous pairing--the world's most famous spy with perhaps the most popular new watch of the last decade, the Aqua Terra 8500. In the process, the AT loses its beloved teak lines in favor of a different texture--read on to find out how it fares. Neither James Bond nor the Omega Aqua Terra 8500 need any introduction. You've no doubt already seen five or more James Bond movies--the character is simply part of the English vernacular at this point. And, if you're a watch collector, a safe assumption if you're reading this in the first place, you already know the Aqua Terra 8500. In fact, there's a pretty decent chance you already own one--I know I do. But whether you're already intimately familiar with the Aqua Terra 8500 or not, the James Bond edition is a very different watch. The differences are obvious--the teak dial is gone. In its place is a new texture, a repeating Bond family coat of arms motif. The seconds hand is now bright yellow, again adorned with the Bond coat of arms. Yellow accents are sprinkled throughout, in sharp contrast to the dark blue metallic dial. But the back of the watch is actually probably the coolest part. The famous gun barrel sequence that introduces every James Bond film has been replicated in the rotor, which resembles rifling. At the center is the rim and primer of a bullet with James Bond engraved. Naturally, the rotor winds Omega's anti-magnetic Master Co-Axial. One of the reasons the Aqua Terra 8500 is so successful is its teak dial, now commonly utilized by many of their competitors. It was a risky move to remove its most recognizable feature, but Omega did it anyway. Nonetheless, this isn't a matte or flat dial, it simply has a new texture altogether. Fortunately, the teak's replacement is very cool, and surprisingly, quite subtle. Omega has put the Bond coat of arms on its side, back to back, giving it an almost egg shaped appearance. The chevron on each shield actually form a sort of cool wavy vertical line, retaining some of the teak dial's appearance. Interestingly, the banner of the fictional Bond coat of arms is emblazoned with the words ORBIS NON SUFFICIT, or as it is better known in English, the world is not enough. It's difficult to appreciate in a static medium like a photograph, but the dial is actually a surprisingly shiny metallic blue. It's quite dynamic in real life. Make sure to see our video to get a better idea of the luster of the dial. The only explicit reference on the dial to James Bond, however, is in less-than-restrained yellow writing. The Master Co-Axial Chronometer writing is present, as it is on all the equivalent Aqua Terras, but below is the rather clever 15,007 gauss writing (get it? 007?) instead of 15,000 gauss. Nonetheless, it's a surprisingly understated approach to Bond branding--it might be bright yellow, but it's still quite small. The Bond coat of arms motif returns once more for the bright yellow seconds hand. This is, perhaps, the most obvious change in the Aqua Terra, yet even here it's reasonably restrained. Aside from the seconds hand, the other hands are typical of the Aqua Terra. That's a good thing--the hands are one of the things I really love about the AT--I like that they look quite massive, not like tin cutouts. I also like that the lume is put on very different parts of each hand, and in a different shape, making it more legible in low light. It should also be noted that, like most other 8500s (basically excepting the annual calendar 8601), the hour hand is independent like a GMT watch. Also unchanged are the "tooth" hour markers, another of my favorite AT features. The minute markers around the perimeter are now yellow, however. In many ways this watch resembles (but is ultimately more attractive than) the original anti-magnetic 8500, the "Bumblebee" watch. The lume is quite good, for a non-diving watch anyway. I like that you can still see the Bond special edition design even at night, thanks to the illuminated coat of arms. The date is perhaps my only real point of dissent on the watch. 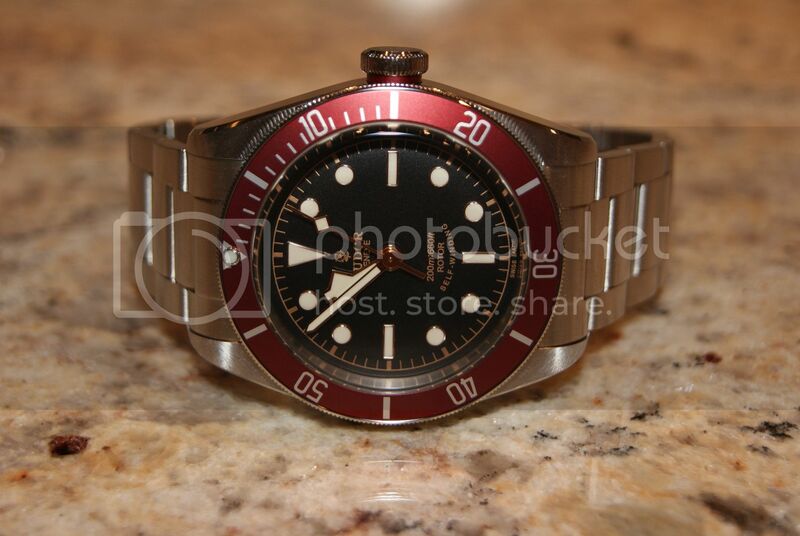 Like other Aqua Terra Master Co-Axials, the date frame of the original AT 8500 has been removed. The absence of anything at 3:00 is a bit distracting and doesn't quite fit the look of the rest of the watch. 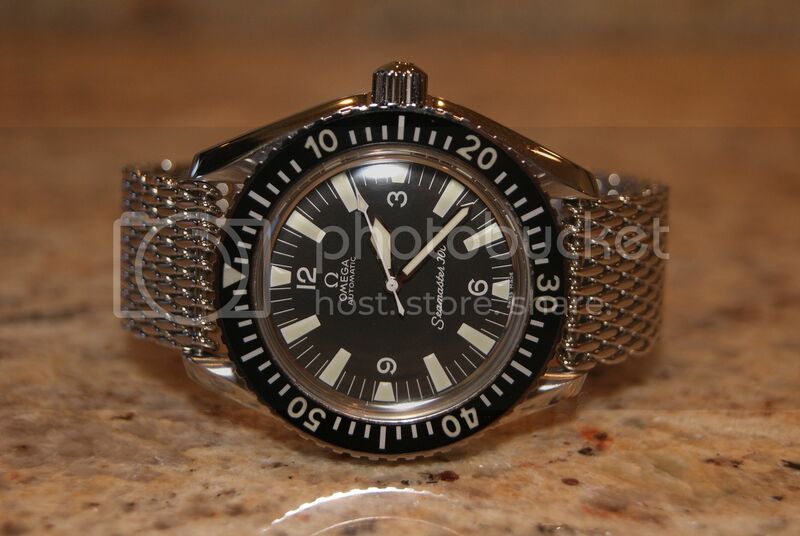 If Omega had wanted to avoid the frame, I would suggest they employ the method they used on the Aqua Terra GMT. In that watch, the date is at 6:00, meaning the asymmetry is less obvious, but it also has a small vestigial hour marker directly below it. Better yet, I probably would have left the date off altogether on this model by using the Seamaster 300's movement, the 8400. Still, a minor quibble. Ultimately, I think the new dial looks fantastic. I would actually like to see this dial in a regular production model. I generally shy away from combining two colors that contrast so much, but it works here. It does, however, perhaps lose a bit of the versatility of the typical AT since it's a much more eye catching model. That said, I love the new texture they used. I like that it possesses Bond heritage and yet isn't ostentatious--you'd have to look really close at the watch to tell that it had anything to do with James Bond. That's one reason why this model isn't just a gimmick--the stylistic changes aren't merely marketing tie-ins, they genuinely look great. The visual changes to the movement are far more radical thanks to the addition of a new rotor. The 8500 has always been a great looking movement, but this James Bond-inspired rotor really enhances the cool factor. While the Bond influence may be restrained on the dial side, it totally lets loose on the back. I think that's probably the best way to execute this design--it simultaneously allows it to honor Omega's James Bond heritage without losing much versatility anywhere else. Speaking of which, check out this rotor, the center of which is identical to the rim and primer of a bullet. James Bond is engraved on it, but it's unlikely anyone would miss the significance even without the writing. So the rotor is cool, but what about the rest of the movement? The 8500 was celebrated for its innovative approach and good looks, but it came out all the way back in 2007. The watch world largely agreed it was one of the best new movements of its day, but is it still competitive in 2015? In a word, yes. The 8500's design was so effective in 2007 that even had it not been modified, I'd still argue it's one of the world's leading mass produced movements, but Omega is not a company to rest on its laurels. Like they did with the older 2500 movement, the 8500 has been updated several times throughout its life. 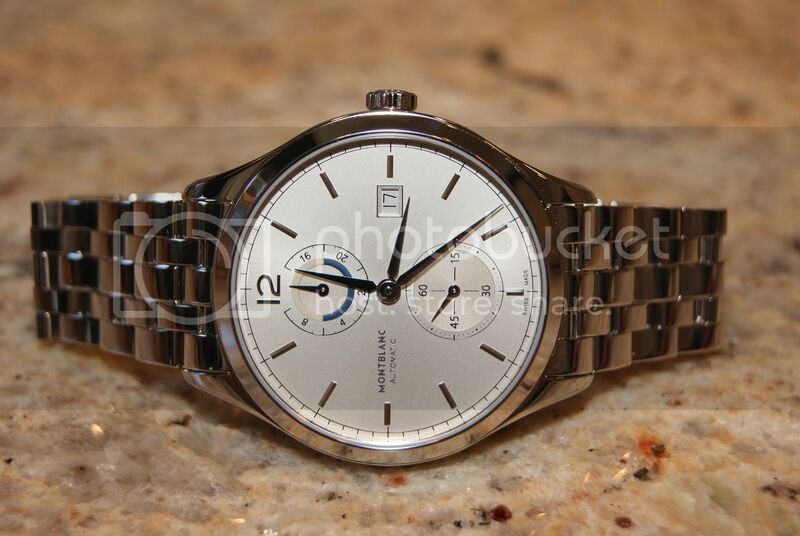 Originally, the Aqua Terra 8500 was featured with a conventional metallic hairspring but was later updated with the newer silicon (Si-14) hairspring. Omega was one of the big innovators in silicon components, having attacked this problem relatively early on. The advantages of a silicon hairspring are significant: its light weight makes it less susceptible to shock and its non-metallic composition makes it immune to magnetism. Today we're looking at the most horologically advanced iteration of the 8500, the Master Co-Axial 8507. The main difference in this new model is that the components susceptible to magnetization have been replaced by ones that aren't. Omega already did the bulk of this work when they introduced the silicon hairspring, by far the most troublesome piece in terms of magnetism, but in the 8507 they went as far to rate it as a fully anti-magnetic watch, comparable to favorites like the Rolex Milgauss. In my opinion, however, Omega's solution is far more elegant. For one, it allows the owner to see the movement, having done away with the need for a soft iron core (or any number of different alloys, to be technical), and secondly, it's an inherently lighter design for the same reason. But perhaps more impressive is the simplicity of the solution. If we view magnetism as a disease, I would compare the anti-magnetic cage approach to a quarantine and Omega's approach to a vaccine. But there's much more to the 8507 than being virtually immune to magnetism. Other features, like a dual mainspring design, give the watch a 60 hour power reserve, about 50% more than the industry standard. Furthermore, similar to Jaeger LeCoultre's Autotractor movements, the rotor rides on a ceramic (zirconium oxide) interface, reducing wear. 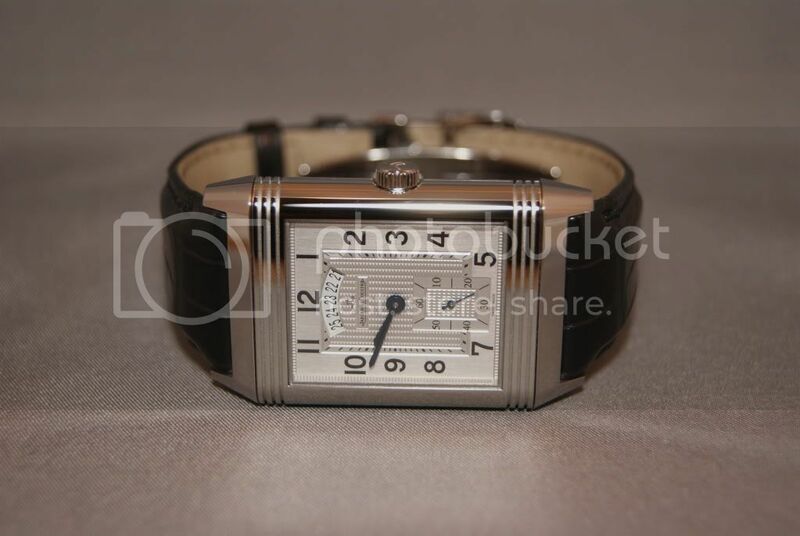 Unlike JLC, however, Omega has retained the more traditional bidirectional winding mechanism. I've always had a slight preference for bidirectional automatic winding, and perhaps not for the reasons you'd suspect. The main reason I prefer it is that it generally eliminates winding noise, associated with the high-RPM freewheeling of unidirectional rotors when they're going in the nonproductive direction. Another reason, I suspect due to the mass of the weight required to make unidirectional winders comparably efficient (purely my speculation), there is no rotor wobble. Consequently, you will likely never know your Omega is winding itself at all. 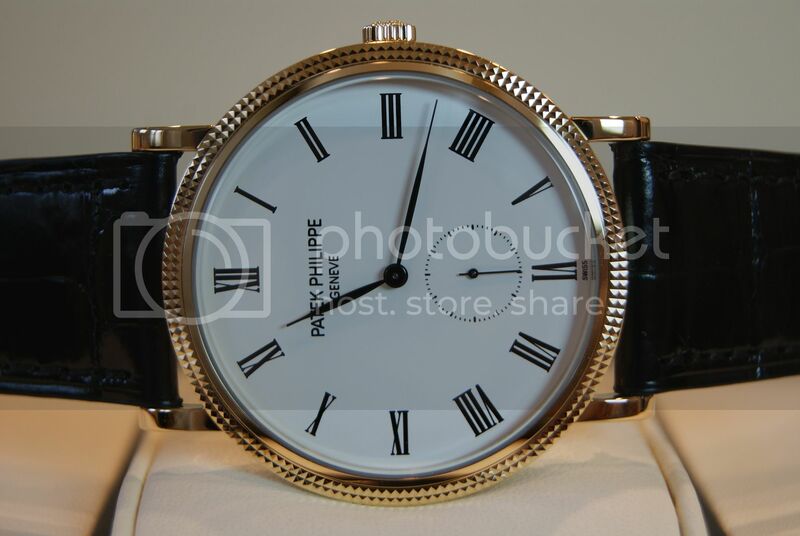 An odd, but helpful, feature of most 8500s, including this one, is the independent hour hand. It is highly unusual to see independent hour hands outside of GMT watches, but the 8500 is one of those exceptions. Basically, this allows you to change the hour without affecting the minutes or seconds--this makes it much more convenient to change time zones or DST. Like a GMT watch, there is no quickset date, but this is accomplished fairly easily since it takes very little time to move the hour hand alone 24 hours forwards or backwards. Of course, if you do want a GMT complication in your Aqua Terra, Omega offers those as well--an option worth considering as I suspect the AT GMT may be my all-around favorite of the Aqua Terras--but that's a review for a later date. Returning to the movement, by far the most prominent feature of any 8500 is the co-axial escapement--it says so on the dial, after all. The co-axial escapement has been a rather polarizing achievement of legendary watchmaker George Daniels. It was designed primarily to reduce friction and wear in the area of a watch that receives the most punishment, the escapement. The constant and repetitive contact of the pallet fork and escape wheel need lubrication and eventually wear down, requiring service or being penalized in stability. The co-ax does not eliminate these problems, but instead alleviates them. Consequently, the performance advantages of a co-ax are mostly not observable on day 1 of watch ownership--the co-ax is instead designed to perform better several years into watch ownership, something reflected in the brand's 4 year warranty and extended service intervals. For these reasons, I still consider the 8500, particularly this 8507, to be among the finest production movements in the world. I'd even go so far as to argue it's a superb value. The 41.5mm case is probably the ideal medium between the smaller 38.5mm and the 43mm case that we see in the more complicated (chronograph, annual calendar, GMT) Aqua Terras. The Bond's case appears to be basically identical to other 41.5mm AT cases and is classic Seamaster all the way. 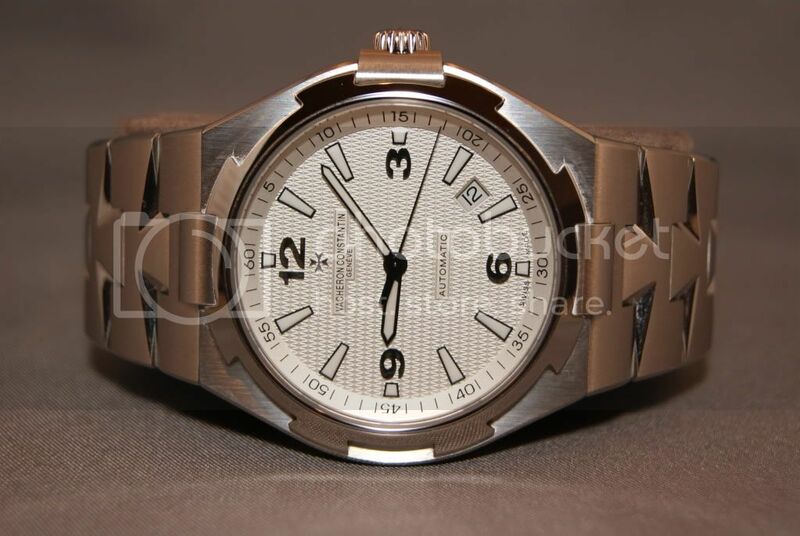 One of the great things about Aqua Terras is that they don't forget their Seamaster lineage. Consequently, they feature screw down crowns and a 150 meter water resistance rating. It's not a diver replacement but it certainly isn't afraid of water and will be completely at home in the pool or on the beach. Like most contemporary watches, particularly those with high performance automatic movements, the Aqua Terra is a hair on the thick side. I think the proportions are good for a 41.5mm watch, but if you're looking for an extra thin watch, you're going to be better off with the Omega Tresor. The case of the James Bond Aqua Terra may not be especially novel, but it didn't really need to be--the AT has always had a very nice, classic case with bonus water resistance. The bracelet is a bit more interesting. It hasn't been altered for the James Bond edition, but it is the new version for the Master Co-Axial model. The difference between the ordinary Aqua Terra and the Master Co-Axial is that the center links are polished, not unlike a certain other anti-magnetic watch. This has been a somewhat polarizing change, but I think it looks good here. The signed clasp looks terrific. I really like how flush it is with the rest of the bracelet. The butterfly clasp is very reliable on these bracelets. The pushers only open half of the clasp while the remaining half has ball detents. This means that it is virtually impossible for it come undone unintentionally--a series of two different events would have to happen in a certain order for that to occur. I also like that friction half of the clasp seems to be held in place with ceramic ball bearings. Their presence implies that the clasp is designed to last a very long time. If you can't see the new Omega James Bond Aqua Terra in person, the next best thing is our high definition video. Did you like the regular Omega Aqua Terra 8500? Of course you did, everyone likes that watch. Then you might very well be interested in this James Bond edition. I'm really pleased that Omega managed to avoid anything truly gimmicky on the front of the watch--sans the 15,007 writing, you'd never suspect it had anything to do with James Bond. Unless, of course, you're unusually familiar with the Bond coat of arms. Because the watch refuses to rely on gimmicks, it has to rely on something else: good looks. The Aqua Terra 8500 has always been a great looking watch, surely a future classic, but I think this Bond edition is even cooler. I love the shiny blue textured dial and yellow accents. It's a much bolder watch than almost any other stainless AT, and consequently, somewhat less versatile, but I still think it's probably the coolest looking AT 3 hander out there. I liked the Bumblebee too, but I'd take the Bond version without a second thought. Like James Bond, this Aqua Terra knows there's a place for discretion and a place to reveal your secret identity. That place is the back of the watch. Here a truly wild rotor has been installed and the resemblance to the famous opening sequence is significant--you don't have to use any imagination here. Because Omega saved the over-the-top James Bond imagery for the back of the watch, it didn't significantly compromise the versatility of the piece. 99.9% of the time, only the owner will know it has anything at all to do with the Bond franchise. I like that the watch is a complete package as well. Any 8500 is a wonderful movement, and no one would have blamed Omega for giving it the basic version. Omega instead chose to employ their finest automatic, the Master Co-Axial. In the end, you have a versatile sports watch that can resist massive magnetic fields, maintain chronometer accuracy for extended periods of time, go swimming and honor one of the greatest film franchises: the James Bond Aqua Terra. Last edited by Timeless Luxury Watches; July 11th, 2015 at 00:01. What is the official recommended service interval these days for an Omega 8500 based watch? Timeless Luxury Watches likes this. Another incredible review from Timeless, but I just lost a little more respect for Omega because of this gimmicky offering. Nice review and pics, but this one just isn't for me at all (and not because I'm not a 007 fan). As LE Omegas tied to James Bond movies go, this is a winner in my book. The dial pattern isn't obvious, and except for the "007" in yellow on the dial, you would hardly know it's a movie tie in. 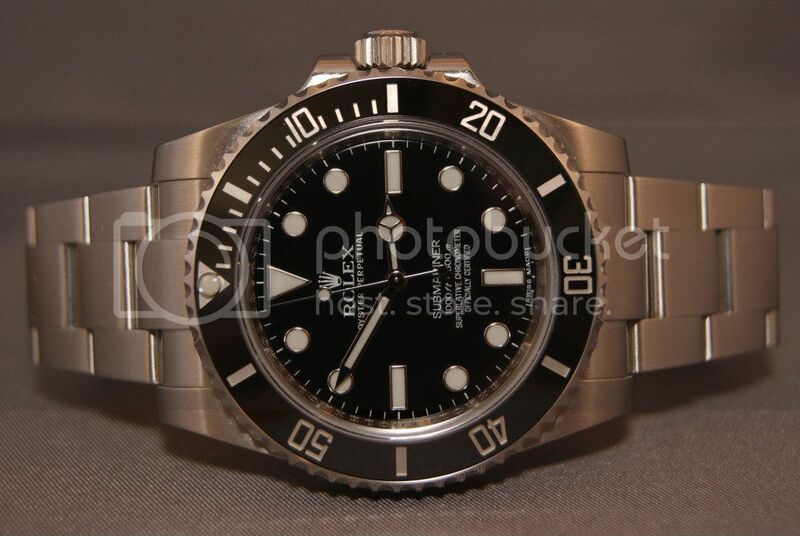 Just compare it to the LE POs Omega released with Quantum of a Solace. That was cringe worthy. As it is, I like this version a lot. Officially it's 4-5 years but it'll be interesting to see if that increases as time goes on. It's implied that the 8500 can go longer than that since that's the general recommendation for Omega. I completely agree. The managed to thread the needle of a tacky marketing tie in and keeping the classic looks of the AT on this one. The look of the movement is awesome. I think it's too gimmicky. I personally don't want a watch that says 007 on the dial. What's the point of this watch? I would certainly hope Bond isn't wearing this in the next movie. Lol. So I guess it's targeted at the wanna be Bonds who are excited to advertise it on the dial and case head inspired movement. I like Bond (hey I'm a Brit over 40!) the watch looks....(I'll be kind) well its not really Bond at all, where's the simplicity/ functionality and the Royal Navy connection?